Hey guys! I had the day off today and John was done with his finals at three so we decided to make a quick comfort food meal and I wanted to share the recipe with you! Now that I'm thinking about it I wish I would have taken pictures during the process to show you guys the steps (another beginner blogger lesson learned), but it's a pretty simple recipe so you'll easily get the same results w/out step by step pictures! Next time I'm going to have to have a little photo shoot throughout the cooking process. Prep time: 10 min. Cook time 40 min. Total 50 min. six "deli slices" of provolone cheese, we used the cheese that's pre-sliced in the package. Note:When my mom makes baked pasta dishes like this she uses cottage cheese, I don't like the texture of cottage cheese at all so I always use ricotta. You can use whichever one you like/is cheapest/etc. 1. Boil water with a little bit of salt in it, add noodles boil for 7-8 minutes or until pasta is "Al-dente". strain from water and set aside. 3. Add ground beef to the pan, brown and add salt and pepper to taste. After beef is browned, drain out any fat if you have too (we use extra lean ground beef from a meat market in town and don't usually have any to drain out), then add spaghetti sauce. We only added about 40 of the 48 oz container. Let simmer for 10-15 minutes. -1 cup ricotta cheese, smooth it out as best you can. 5. Bake for about 30 minutes or until the cheese on top is melted and slightly browned. Take it out, let it cool for 5 minutes, and your ready to eat! 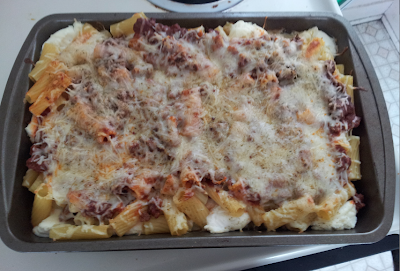 I love making baked pasta because it's easy and baking the dish brings out more flavor! I don't usually like to make big quantities of food because I'm usually just making dinner for two, but I made a whole pan of this because I know it is good re-heated!